Hellooooo! I’m alive, I’m alive! Did you think after my 10-year blogiversary post that I decided to take a 10-year break? lol. It’s been a busy month with a lot of fun events going down. I just returned from WXN’s Canada’s Most Powerful Women celebrations, and I’m still riding the high of winning an award in the Entrepreneur category and meeting so many incredible people. So many happy tears this week. It felt (and feels) absolutely surreal. I’m super inspired by these amazing Canadian women to keep going forward, doing my part to give back, and creating meaningful change in this world. I’m grateful to you all who support me and what I do…truly, thank you. As an introvert, big social events tend to tucker me out (anyone else?! ), and I find myself looking forward to my first day without any commitments (aside from, umm, two hyper toddlers, I suppose…). This creamy 3-ingredient steel-cut oatmeal recipe is the one I’ve been making once or twice weekly since fall hit. It may sound strange, but I find it calming in a way. I just love that I can throw a few ingredients in my Instant Pot, stir it up, and walk away until it’s done cooking! No stirring or watching…woot, woot. I’ll often throw it on and then get ready for the day or feed the kids and come back to a hot pot of oats. It’s a good feeling…a darn good feeling! Don’t worry if you don’t have an Instant Pot because I also provide a stovetop version below—your oatmeal will turn out the same either way, but the stovetop version just requires monitoring and stirring as it cooks. This time of year I love to top a hot bowl with toasted walnuts, chopped dates or raisins, cinnamon or pumpkin pie spice, maple syrup, and seasonal fruit like pear or pomegranate. So cozy! Walnuts or pecans with maple syrup, cinnamon, and peanut butter is another dreamy combo. This coming Tuesday, we’ll be donating 100% of that day’s OSG recipe app proceeds to Toronto’s Daily Bread Food Bank as our way to take part. I hope you’ll consider participating in #GivingTuesday too! 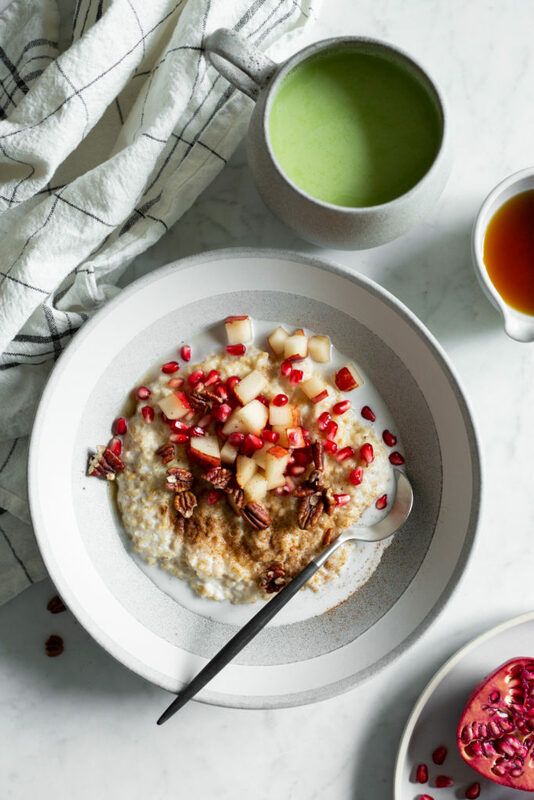 My goal was to create the creamiest bowl of steel-cut oats using just a few ingredients...and this is it! 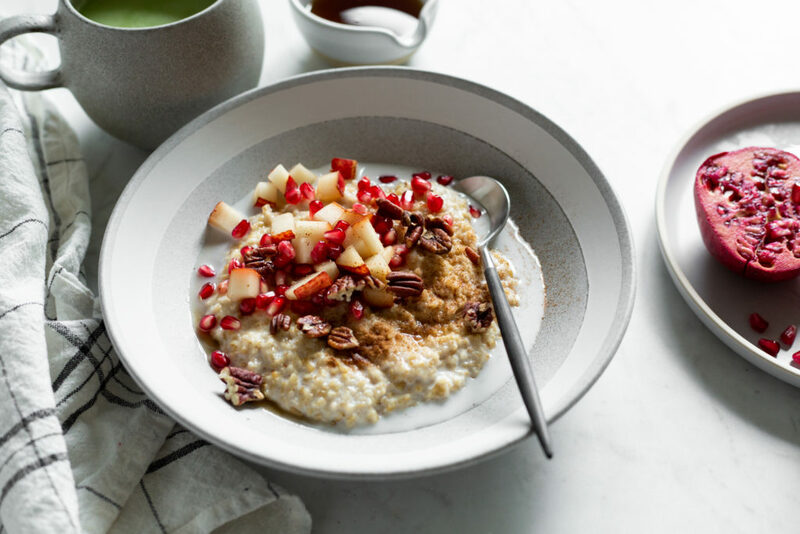 This luxuriously chewy steel-cut oatmeal is the perfect base for all of your favourite topping combinations. I love adding pure maple syrup, cinnamon, seasonal fruit, toasted walnuts, and chopped dates or raisins. It doesn’t get much cozier on a cool fall or winter morning! I’ve also provided cooking instructions using both the stovetop and Instant Pot (I prefer the Instant Pot method as it's so easy). For the Instant Pot method, please see the Tip section. STOVETOP METHOD: Pour the can of coconut milk and 1 cup (250 mL) water into a medium pot and bring to a low boil over high heat. Add the steel-cut oats to the pot and stir to combine. Immediately reduce the heat to low (low heat is important or they’ll burn) and gently simmer, covered, for 30 to 40 minutes, stirring four to five times during cooking and reducing heat if necessary to prevent burning. This method produces a thick pot of oats. For a porridge-like consistency, stir more water in to your liking. I like to stir in about 1/2 cup (125 mL) water after cooking. 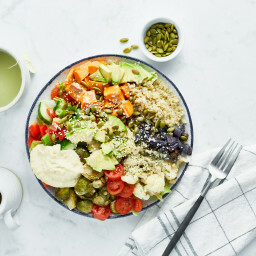 Portion into bowls and top with your desired garnishes—I love the combo of pure maple syrup, toasted walnuts, seasonal fruit, fine sea salt, cinnamon, and raisins or chopped dates, but feel free to get creative and change it up depending on the season. Leftovers will keep in an airtight container in the fridge for 5 to 7 days or you can freeze them for up to 1 month. I store cooled single portions in freezer-safe bags and lie them flat in the freezer for easy stacking. Reheat refrigerated or thawed leftovers on the stovetop in a small pot along with a splash of water or milk over medium heat. Recipe makes 2 3/4 cups total. Add the coconut milk and water to the Instant Pot, followed by the oats. Stir to combine. Press the “Pressure Cook” (or “Manual”) button and set the cook time to 7 minutes on high pressure. After 5 seconds you’ll hear a couple beeps and the screen will say “on”. The cooking process has begun! Once finished, you’ll hear a few beeps letting you know that cooking is over. Now let the Instant Pot do a “Natural Pressure Release”—I wait 10 minutes for most of the the pressure to release on its own. Carefully release any remaining steam before removing the lid. 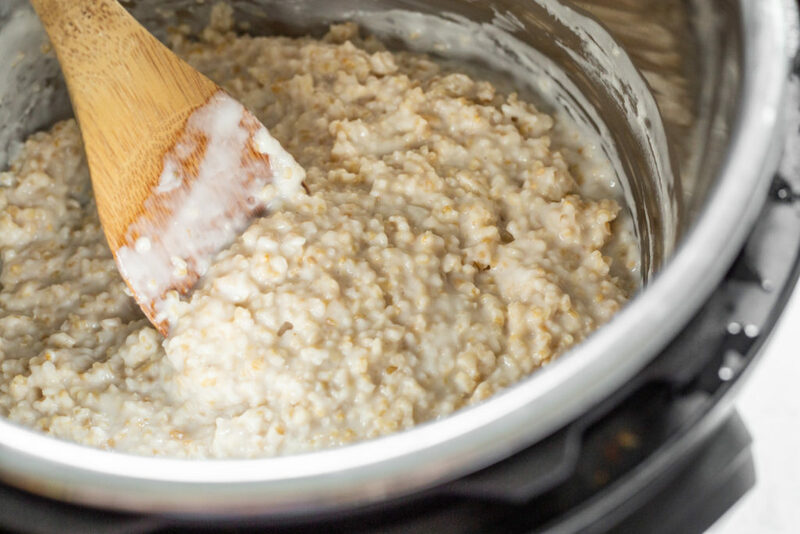 Stir the oatmeal until combined, adding more milk or water if you’d like to thin it. It’ll be oh-so-creamy and continue thickening as it sits! You can also make pre-portioned servings so all you have to do is dump it in a pot in the morning and quickly heat it up with a splash of milk! Congratulations! We have an IP that has yet to be broken in and this will be the recipe to do it! Where did you get the cute glass jars in the last picture? Those would be perfect for his oats and my chia seed parfaits. Happy Holidays! I found my Luminarc glasses with lids at Costco about 4 years ago. They have not had them since then, because others that have seen mine would also like them. haha…same Scott, same. ;) And thanks for the Amazon tip! Thanks, Scott!! I just ordered them. Happy holidays!! Yessss, I have those Luminarc glasses (we use them for everything… they’re our daily drinking glasses and also our food storage containers). They’re the BEST. They have a larger version, too. So glad to hear you love them too! Congratulations on your Entrepreneur award!! How does it feel to be selected one of Canada’s Top 100 Powerful Women?!! You deserve it. The love and care you radiate for your family shines so brightly and the care and devotion you pour into your blog, app and books is so evident. Everyday that I have worked on your team has been a joy and you treat everyone with kindness, generosity and such respect. I am one of the few people in the world who hasn’t a single complaint about her job :)! About this recipe…It has become a quick and easy staple here! I throw it into the Instant Pot before my crew of kids needs breakfast, and it is cooked, kept warm and ready when we are. Velvety and soothing on these wintry autumn mornings! Oh jeez, more happy tears in my eyes! lol. I can’t thank you enough for everything Nicole…working with you (and having you become a dear friend) has been an absolute joy and I’m so grateful to have you on our (small but mighty) team! Your passion for this role inspires me daily. Well, oh my gosh, right back at ya!! Hey Angela, thanks for this recipe. I have love your recipes but since getting my own instant pot, trying to find more recipes using Instant Pot instead of trying to guess. Do you think you would ever release another cookbook with only using Instant Pot recipes? I would love to see a Canadian author create an exclusive healthy Instant Pot cookbook! This made my day (ckbk 3)! We’d love IP adaptations for any recipes you do, as well! Hi there! I just unboxed my Instant Pot and want to try this recipe. Would regular coconut milk be too rich for this recipe? Hey Lillian, Oh great question! I haven’t made it with full-fat canned coconut milk yet so I’m not sure if it would provide enough liquid for cooking. The Instant Pot can be sensitive when there isn’t enough liquid. If I was going to attempt it, I would probably add an extra 1/2 cup water just to be sure. :) If you try it out please let us know how it goes! Thank you Angela for the recommendation for the additional 1/2 cup water. It turned out perfect! Though I did find the oatmeal to be a bit chewier than I like. I may increase the cooking time next time. Hi Lillian, So glad you tried it out. Thanks for your feedback! Defrost some frozen berries and warm them in the microwave, then stir them into the oats with some maple syrup and ginger (I used dried/powdered). The flavor is fantastic and you get all the taste and vitamins of glorious spring berries, but without the cost and forethought. The juice from the frozen berries gets sucked up by the oats and its SO tasty. Awesome ideas…I always have my freeze stocked with frozen berries over the winter too. And I love how they turn the oats beautiful shades of red and purple. I’ll have to try adding frozen berries to my IP recipe and see what happens! Hello! I make steel-cut oat porridge for my 3-year and myself 4-5 times per. To make the porridge soft and creamy I soak my oats overnight, which really improves the texture by 100%. I also add a pinch of salt to it when I’m cooking it, which brings out the yummy flavour of the oats. I usually cook my porridge with half of the liquid being water and the other half either soya mylk or homemade almond/hazelnut mylk. 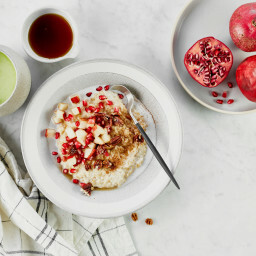 As low-fat coconut mylk has fillers, can you recommend away to make this porridge with full fat coconut mylk? Hey Laurie, Oh those santa claus parades can be tiring! I felt like I needed a nap after ours this year. haha. I haven’t tried this with full-fat coconut milk yet, but it should work, I would just add a bit more water (1/2 cup maybe) to make up for the thicker cream that’s found in the cans of full-fat. I’d love to hear how it goes if you try something! Congratulations on the award. Obviously well deserved. Your great photos of food always inspire me to get back to foods I sometimes forget about (or try new ones). I always love creamy steel cut oatmeal but I haven’t made it in ages. Now that I see your photos it makes me want to make some right now. I’ll make it to your recipe next, with the coconut milk, looks delicious. Thanks for your congrats! :) I tend to forget about foods I love too, and it’s always fun finding them again, heh. Hope you enjoy it! Congrats on your award! Will this recipe work with almond milk? Thanks! Hi Mina, Thank you! :) I haven’t tried it swapping the canned coconut milk for almond milk unfortunately. It should work, it just won’t be as creamy and thick. I’d love to hear how it goes if you try it! This is great! Thanks Nicole :) Vegan butter or coconut oil stirred into oatmeal is just incredible too. Congrats on 10 years Angela, I’ve been reading since that very first Halloween with your first post. You left a comment on katheats, and I clicked, pretty sure it was because you mentioned your are Canadian. hehe. I’ve never turned back. aww you’re so sweet Hayley!! Your comment just made my week, thank you so much. That’s so funny you found me way back when on Kath’s blog! Thanks so much for including more instant pot recipes. I will definitely give this one a try. I just made your glowing lentil soup this morning in the instant pot before work. I realized I had nothing to bring for lunch and I have been wanting to try the soup in the IP to make it faster. I just sauteed the onion and garlic for a few minutes in the IP and then added the spices. I turned off the pot and added all the other ingredients. I did cut the liquid to 2 cup veggie stock and one cup coconut milk. Cooked it on Manual for 3 minutes and let the pressure release naturally. Then I removed the lid and added the the spinach and lime juice and let the spinach wilt a bit. It turned out so good. I may use a little more liquid next time but I was so happy that it turned out good on the first try. Truthfully it may take the same amount of time as it would have on the stove top since you have to wait for the pressure to come up but I love the set it and walk away ease of the instant pot. Hi Stacey, Oh thanks so much for sharing the Glowing Lentil Soup success in the Instant Pot! I’ve been trying a lot of my soups with success but have yet to try this one out. :) My 7-Vegetable and Cheese Soup is also lovely. Oh we love that one too! I will be giving that one a try this week too. My kids love to dip the crouton bread sticks in it. Thanks for that idea in your book. It is definitely a staple in our house. Hi! Just a question about this recipe. 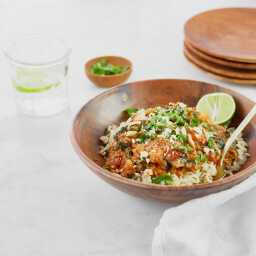 I am not a big fan of coconut anything, will this recipe taste coconut-y and if so, any recommendations on other plant based milks that would go well with this recipe? I would be making it stove top. Hi Carline, I haven’t tried it yet but I think cashew milk would be divine! It won’t be as creamy using cartons of plant milk, but it should still work fine if you substitute the same amount (I believe the can of light coconut milk is 400 mL). Look forward to trying this recipe and am hoping you will add a lot more instant pot meals to your blog!! Thanks Colleen! It’s been a bit of a process experimenting with the IP so far, but I’m getting the hang of it slowly but surely! I tried this recipe yesterday morning over the stove, with no deviations from your recipe. I have a husband who hates oatmeal and a picky three year old to feed. Our schedule is chaotic and breakfast is usually an afterthought. I saw the recipe and wanted to see if it could bring us back to the table, and have a mutually shared breakfast experience. Well, it worked! My husband inhaled the oatmeal and asked for seconds and the three year old happy ate it with no complaints. I love the creaminess of the oatmeal, and the different textures made for a complete and filling meal. Inspired, I tried the zucchini bread oatmeal today and it was incredible!! Hey Silpa, I’m so glad both recipes were a hit! Thank you so much for your feedback. I can’t wait to try this recipe. Thank you for including the Instapot instructions! Quick question, where do you find those little Tupperware pots for storing weekly portions? Hey Katie, The jars are Luminarc brand. I can’t remember where I purchased them, but a reader said he found them on Amazon! :) Hope this helps. 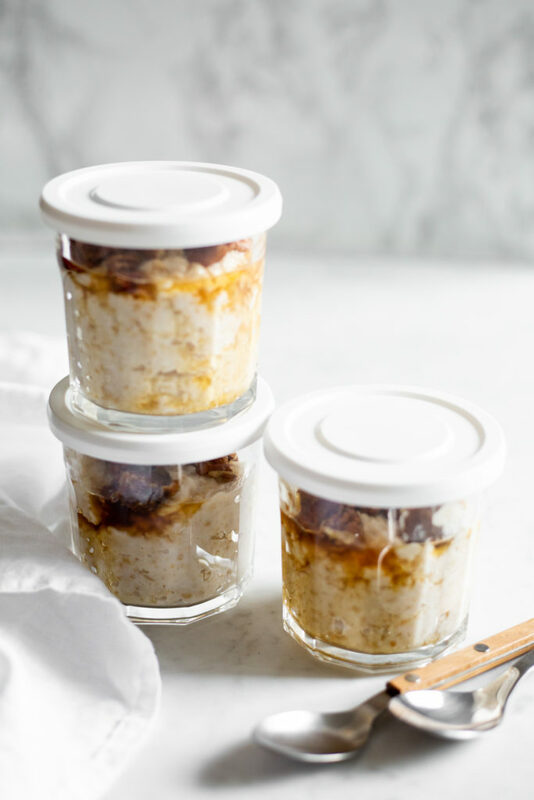 The first few times I made steel cut oats in the Instant Pot, I used the fast cooking or quick and easy steel cut oats. Unfortunately, I got a burn nessage every time. 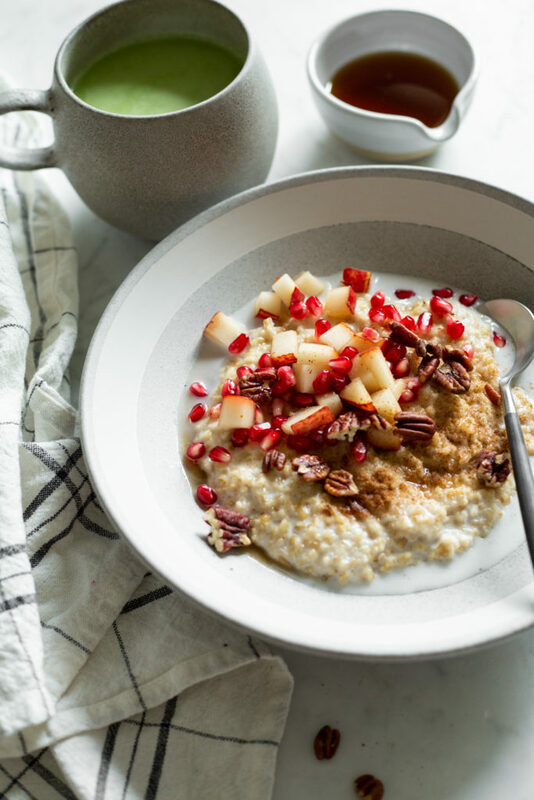 Luckily, I have never gotten a burn message with this recipe when using regular steel cut oats, and they cook so quickly in the Instant Pot that a fast cooking cut isn’t needed :) I hope this helps. I’m looking forward to trying this, yet another of your delicious recipes! I’ve been reading your blog for almost a year now, and so appreciate all the love you share. Your recipes are deliciously dependable. This is my go-to blog for vegan recipes! Most of all I appreciate the authenticity with which you share about your life. It is courageous and so supportive for the rest of us. This is my first OSG recipe I’ve made, even though I’ve been following you for awhile now. OMG this was so good! I used full fat coconut milk because that’s all my grocery store had and cooked it on the stove top. It was so creamy and delicious! I usually like my oatmeal very sweet but it tasted great as prepared without any other toppings. Looking forward to having this for breakfast this week! Hi Angela! I’ve used your cookbook for years and am now starting to follow your blog as well. Thanks for all the inspiration! A general question, in particular about smoothies – I don’t/can’t eat bananas and they are included in so many smoothie recipes. Do you have a suggestion for a substitute -thanks! Thank you so much for your support for my books and recipes! I’m glad you found your way to the blog too. :) As for swapping banana, I usually say that it depends on the recipe what I will recommend as a swap. If you have any specific recipes in mind, please let me know and I’d be happy to offer subs! I always have trouble getting steel cut oats to be creamy, but this recipe is amazing! This is such an awesome recipe. Thank you so much for sharing, I just love it. Bookmarked your website. Absolute perfect recipe. Thx so much. Will make this often! Hi Angie, I’m so happy you love it so much…thanks for letting us know! i think we are finally getting an instant pot (!!!) – my question to you is whether I can make a recipe such as this in the 8qt pot without needing to double it? i like to batch cook and make larger roasts, and am planning on the 8qt but at the same time am wondering if that will force me to have to double every other recipe i want to try… do you know if you can use 6qt recipes in an 8qt pot? Hey Allison, hmm…good question! I haven’t tried it myself, so I can’t say for sure. I know Instant Pots can be a little finicky sometimes, but I don’t see why it couldn’t work to make this oatmeal in a larger size. I’d love to hear how it goes if you try! A friend recommended your site to me this weekend and I just made this for breakfast this morning. Wow!! Super creamy and satisfying! I added maple syrup, almond milk, and some fresh organic blueberries I happen to have in the fridge. It just made me smile so I wanted to say thank you!! I hope you and your family have a peaceful holiday. Aww your comment made me smile Michelle! Thank you so much for your kind words :) I hope you find many more recipes on here that you love! I love this recipe and I am eating it now as I message you. Nice for a warm winter breakfast. My question for you with the left overs is…… can you microwave it instead of stop top re- heat? To get to work and 2 kids out the door in the winter I don’t have the time. I plan on micorwaving the leftovers on Monday morning and see if it works. I am not a vegan and I eat everything. I consider myself an everything-avore. I do believe in eating balanced meals and trying new foods. My husband is a HUGE oatmeal lover. I’m a grits lover. Just depends what you grew up eating, I guess. Anyway, I made this for him, about an hour ago, in the IP. It came out perfectly. And I’m eating some. And loving it! And wondering if Costco sells coconut milk by the case, because this is going into the repertoire. p.s. I added a bit of vegan butter, salt, dried cranberries and maple syrup to it for serving! I have doubled it and it has been fine. Didn’t change anything. Had it with pomegranate this morning. Yum! Thank you for this wonderful recipe, Angela! I don’t have Instant Pot and I especially did like that you published stovetop version of the recipe. I plan to try it soon and I am sure that my children will love it. Wish you a Happy New Year and Merry Christmas! Merry Christmas and Happy New Year to you too, Michael! My husband gave me your first cookbook some years ago and recently I have begun reading your blog. 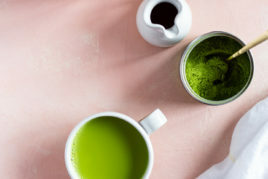 I noticed that you mentioned hormone issues in the piece about the matcha. I also have noticed that I don’t see you using seaweed in your recipes. Since my husband and I have a wild-harvested seaweed business in Maine (he is The Seaweedman!) I wanted to offer you a sampling of our products to try. They might help you with your health issues. Check out our website, theseaweedman.com and send me a note through the contact page and I will send you some seaweed! Thanks for the recipe! Just got an instant pot and looking for ideas. Your recipes are my absolute favorite. What size instant pot do you recommend? Hi Sara, Congrats on your new IP! I use a 6-quart size and I find it’s a nice size for a family or 4 and also for standard-sized soup, stew recipes, etc. Hey Mary, I love how you added the chai spice blend. Sounds delicious :) Thanks for your review! Quick question: I am desperately searching for an soup you posted several years ago (and which I might have modified slightly over the years.) I know for sure it was originally called “Indian spiced red lentil soup,” or something similar. 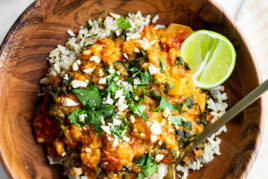 It contained cauliflower, greens, red lentils and sweet potato. I can find a few other similar soups, ie your 10 spice soup, etc. but all those contain tomatoes and this definitely used broth as the liquid base. Anyway, I don’t see the soup in your recipe base. Any thoughts? Can I add a cinnamon stick to this or will that flavor be too strong? Hey Heather, I haven’t tried anything except the coconut milk so I can’t say for sure, though I think it should work just fine! It won’t be quite as creamy of course. I’m not sure about making a triple batch, but if you try something I’d love to hear how it goes. Hey there! Thanks so much for your app support 😁 Hmm it sounds like you’re not getting our new app recipes as each new blog recipe also gets added to our app (usually a day in advance). Please try uninstalling as reinstalling it and let me know if that does the trick. Thanks! Hi! I love this recipe but I get the “burn” error message on my IP 2/3 of the time. Any tips for preventing this? Thanks! Oh no! That’s strange. I would add more liquid (3/4 c?) and that should do the trick. If that doesn’t work you can try not stirring the oats. This is sooooo delicious! 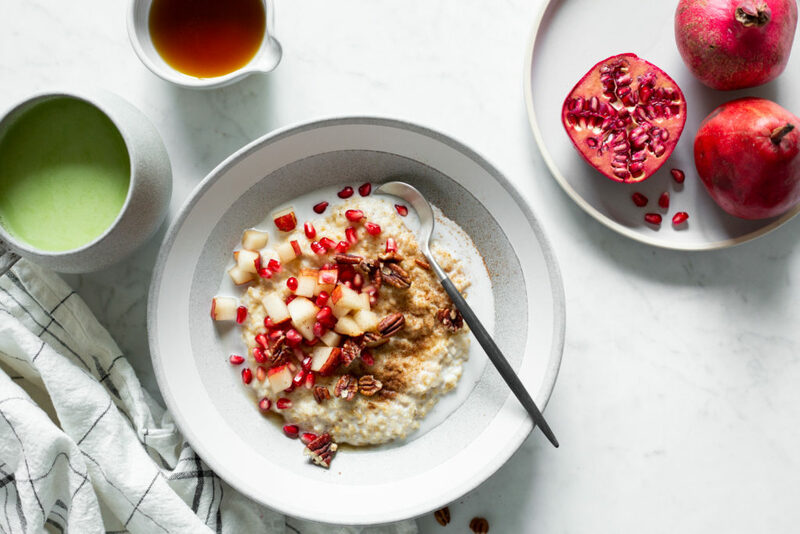 I’ve been searching for a great dairy free steel cut oatmeal recipe and this knocks it out of the park. Creamy, thick and just chewy enough this is perfect oatmeal. Thank you, Angela! I will be making this all winter long to keep warm. This recipe is delicious, make it. 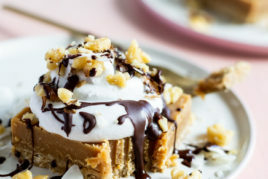 Previous post: Vegan Salted Peanut Butter Crunch Torte + 10 Years!